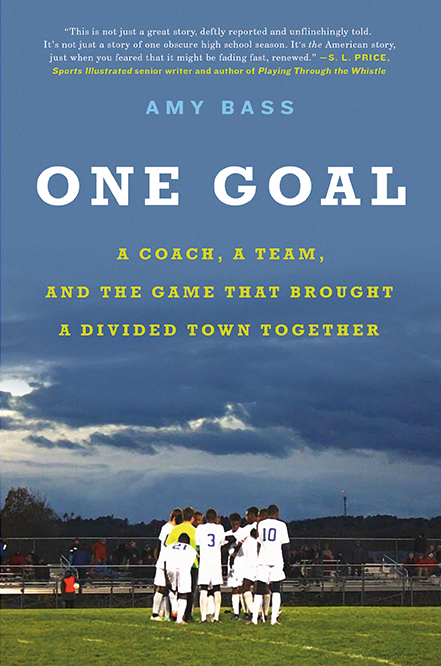 ONE GOAL: A Coach, A Team, and the Game That Brought A Divided Town Together by Amy Bass is the story of how a high school soccer team in a racially divided city created unity through its quest for its first state championship. Bass wrote an adaptation from her book for The Undefeated. Zlatan Ibrahimovic’s debut goal for Major League Soccer, a stinging rocket he pulled out of the air some 40 yards from the box by contorting his body and throwing a leg up high, sent L.A. Galaxy fans into a frenzy, and with good reason. But it reminded me of Maslah Hassan, a high school soccer player in Lewiston, Maine. In a 2015 playoff game against Edward Little High School, the rival school just across the Androscoggin River, the Lewiston Blue Devils took possession of the ball with just 11 minutes left on the clock. Sprinting down the field with no fewer than three Red Eddies marking him, star player Abdi Shariff-Hassan made a long pass to teammate Abdulkarim Abdulle. Stopping short with just a few yards to go, Abdulle flicked the ball with the outside of his right foot over the maroon-shirted defenders and toward Hassan. Not waiting for the ball to land, Hassan flung his right leg into the air for a one-touch goal, taekwondo style. Ibrahimovic couldn’t have done it better. On the surface, the championship quest of the Lewiston soccer team makes for a simple, feel-good tale: Refugee kids make good by playing soccer. But theirs is more than just a heartwarming sports story. In the fall of 2015, the Blue Devils made their run at the school’s first state soccer title in one of the whitest states in the country, and in a city that hadn’t talked about hope for a very long time. The days spent researching and writing ONE GOAL meant poring over game tapes and sports clippings; traveling from Westbrook to Messalonskee to Topsham with the team; conducting interview after interview with players, coaches, fans and families; and reading detailed histories of Lewiston, a once-thriving mill town known as Spindle City that sits on the banks of the Androscoggin River. Many of ONE GOAL’s main characters come from Somalia. Beginning in 2001, thousands of Somali refugees made their way to Lewiston, a city of just 36,000 people. The economic downturn that plagued the city since the mills began to close meant there was space for these folks, who found harbor in the many vacant apartments, sent their kids to the community’s very good schools and set up shop on Lisbon Street in the city’s relatively empty downtown. Walking through the streets that had been largely populated by the French-Canadians who once piled in to find work in the textile mills became a global affair, with places like the Mogadishu Store selling everything from frozen halal meats to 40-pound bags of rice and plenty of Praise African red palm oil on the shelves. ONE GOAL is about the journeys the Blue Devils took to the varsity roster of the high school soccer team. It is about those who began life by fleeing the civil wars of Somalia for the refugee camps of Dadaab, Kenya, and those whose grandparents took the Grand Trunk Railroad from Quebec to find work in Lewiston’s mills. It is about longtime coach Mike McGraw, Lewiston born and bred, and his four-decade quest for a state championship, and newcomer coach Abdullahi Abdi, “the coach of everyone,” according to one community leader, who forged a unique partnership in order to capitalize on the talents of these kids who live and breathe soccer in this hockey town. It is a story of overcoming the racial slurs and insults both on and off the field, of learning to negotiate religious and cultural differences and of putting the game first, hoping that the teamwork it takes to be champions will show a path forward. Coach, the players now joke, doesn’t care where they’re from as long as they pass the ball. That this is a story about soccer is no accident. The game lends itself to a particular kind of teamwork, focusing on continuity more than rupture, success coming to teams that move the ball patiently across the enormous field. The record-breaking 4,500 people who watched Lewiston play its game in the Maine Class A boys’ state championship game on Nov. 7, 2015, saw the team’s motto — Pamoja Ndugu, “Together Brothers” — in action, creating a moment of community, of coming together, that would serve as the exemplar the next time fractures started to appear. ONE GOAL tells the story of this team, this city, these players and coaches, and their families. Soccer serves as a microcosm of Lewiston’s transformations, as the city’s newcomers plant the seeds that serve as the community’s future. ONE GOAL isn’t the story of kids using sports to escape something — it’s not a Hoop Dreams kind of tale. Those who “bleed blue,” as the school’s saying goes, on the soccer field grow into roles as classmates and teammates, friends and neighbors, serving as something the community can emulate. Soccer is how these kids live where they landed. Adapted from the book ONE GOAL: A Coach, A Team, and the Game That Brought A Divided Town Together (Hachette Books, 2018), which was released in February.